Native American (Navajo) frybread; photo by Jimmy Emerson, DVM on Flickr (noncommercial use permitted with attribution / no derivative works). Fry bread is made with flattened bread dough fried or deep-fried in oil, shortening, or lard. 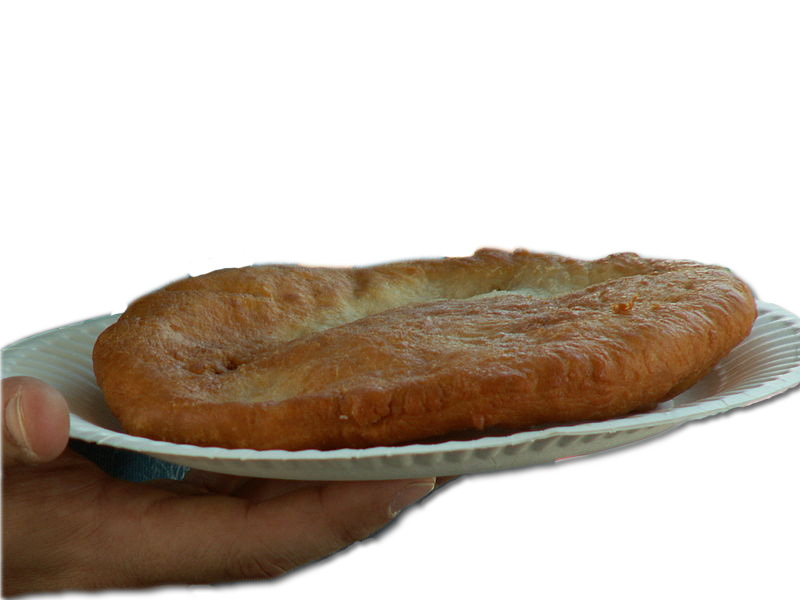 Fry bread is served with sweet toppings such as honey or powdered sugar, or as a "Navajo taco" with toppings such as beans, ground beef, lettuce, onions, tomatoes, and shredded cheese. Native Americans in most areas traditionally ground maize (corn) into flour for tortillas and other breads (baked, dried, fried, and cooked on griddles). Nut oils and animal fat were used to cook some of these corn-based foods. Native leavening agents were wood ash, lime, lye, and sourdough (today breads, including fry bread, are usually leavened with yeast or baking powder). Fry bread is strongly associated with the Navajo. Modern recipes for "traditional" Navajo fry bread (or "squaw bread") call for ingredients such as wheat flour and baking powder, and cooking utensils (such as frying pans and iron cauldrons) that were not traditionally used by Native Americans (they were introduced by European explorers and pioneers). Deep fried doughs flavored with honey, nuts, and spices were also enjoyed in ancient Greece, Rome and Egypt. In many places they were called "fritters." European and American cookbooks from all time periods include many recipes for fried breads. 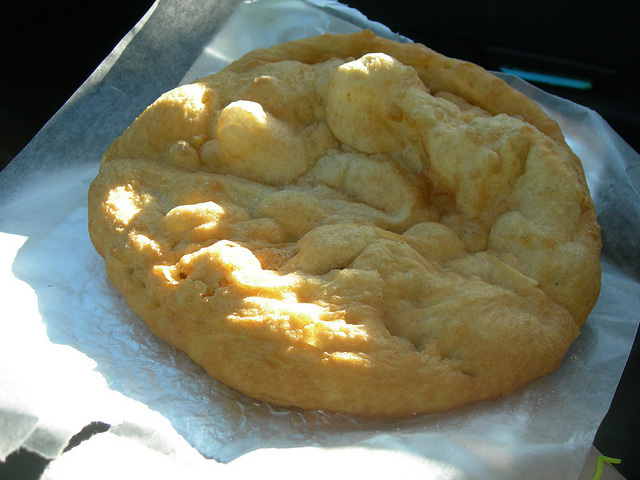 Native American frybread; photo by John Pozniak on Wikipedia (use permitted with attribution / share alike: CC 3.0).